Permaculture is not a word. It’s a paragraph. Some of what I’m putting here is controversial. Permaculture, at its core, is a way of thinking about the world and solving problems in a systematic way that goes beyond sustainable. As Geoff Lawton says, “Don’t plant a tree; plant an ecosystem.” It’s best know applications are to agriculture. High level practitioners are able to achieve feats that are seemingly miraculous (see video for an example). The word was coined by Bill Mollison and David Holmgren. Bill Mollison put together a course teaching the system, and anyone who has taken a PDC (Permaculture Design Course) does permaculture and can use officially use the word. Of course anyone can learn or use Permaculture. Unfortunately, there is quite a bit of infighting in permaculture (mostly among posers). As an example, Mollison and Holmgren told Sepp Holzer that they thought that what he practiced was permaculture and wanted him to use the word, but other lesser practitioners insist that Holzer does not practice permaculture as he has not taken a PDC. Another problem with permaculture is that it is infested with hippies. There’s nothing wrong with hippies per se, but a large proportion of them seem to do a lot of hating in the name of love. Another problem with some hippies is what I call toddler syndrome, “What’s mine is mine, and what’s your is mine.” Some of them will accuse successful permaculturists of not following the permaculture ethics because they make a profit and do not share it with the accuser. These three issues have subsided somewhat as two of most prominent permaculture promoters in the U.S. are pro-profit and pro-results. Their influence has helped attract a large number of new people to the movement who do not share the hippie hang ups. Personally, I see permaculture as a way that Christians can fulfill the first commandment in the Bible, to fill the earth and have dominion over it. Destroying the earth somehow doesn’t seem to be an appropriate part of that plan. Whatever you believe about carbon and Global Warming, there is no doubt that humans have destroyed a large number of resources, most spectacularly seen in the desertification of the Fertile Crescent and sub-Saharan Africa. I think that more Christians should be involved in Permaculture as a way to help the poor, improve their own lifestyles, and fulfill God’s commands. Gaia’s Garden, by Toby Hemenway. This book is a fabulous introduction to permaculture. Toby has a strong science background and it comes through in the text (without being boring). The focus of this book is on urban or suburban lots. If you are wanting to implement permaculture on a bigger scale, then you might want to read this second (after the book below). Otherwise this should probably be your first permaculture book. (see podcasts for an in-depth review). Sepp Holzer is such a genius that he seems crazy to us normal folk. He owns a 90 acre farm in the Austrian alps where he has been able to pull of such feats as growing tropical citrus trees. He has a heavy focus on ponds, water, and hugelkultur (among other things). If you are wanting to implement permaculture in a larger area, this should probably be your best first read followed by Toby’s book (above). My favorite way to learn about things. My two favorite for permaculture are Jack Spirko’s and Paul Wheaton’s. However, as they cover a lot of topics, not just permaculture, I have excerpted highlighted episodes below. (Warning: Paul has a tendency to ramble and get off topic and occasionally cusses). Interview with Geoff Lawton 2 Tony Rinaudo of WorldVision gets a shout out for essentially reforesting Niger with nothing but a pocket knife. His work was brought to worldwide attention because the difference could be seen from satellite. The Man Who Stopped the Desert Not really a permaculture topic, but a cool story of how doing things differently can have a major impact. Interview with Maddy Harland Talks about Sepp Holzer’s project in Portugal (http://www.tamera.org/). What’s Games for Windows Live? It’s supposed to be an online account that allows users to save their game progress online, purchase games, play online with friends, etc. It was announced five years ago, but MicroSoft has never developed it properly. It started out as XboxLive, and embarrassingly, five years later, when you actually sign up for Games of Windows Live, it takes you to XboxLive. Does Microsoft have any idea what message they are sending? Hot off the heels of my story about Google’s incompetence comes a display of Microsoft’s ineptitude. One of the great joys of Thanksgiving time are the fabulous discounts for computer games offered by Steam. Discounts from 50% – 90% are common. So naturally, when Batman: Arkham Asylum Game of the Year Edition went on sale for 75%, I snapped it up. Unfortunately, the good folks at Eidos have saddled, Batman: AA with Windows Live. You can’t save your progress unless you use Games for Windows Xbox Live. Okay, so sign up for an account. But you have to do an e-mail verification…wait a little longer…ask it to resend the confirmation…check to make sure the e-mail address is correct…check the e-mail server…send a test message to yourself…20 minutes later, still no e-mail…sign up again with a different e-mail. Okay, it worked. Let’s play…no, there’s an update for Games for Windows Xbox Live, and I can’t continue unless I let it install…wait five minutes, it looks like it finished, let’s play!. Wait, no…it wants to install the update again! After two more cycles of this, I’m beginning to wonder if Steam will give me refund. Finally, I close all windows including Steam and try to run Games for Windows Xbox Live by itself, and it takes me to Windows Update. I have to patch Windows before I can update Games for Windows Xbox Live…why didn’t it tell me this earlier?? I’m now installing the patch, which will hopefully allow me to update Games for Windows Xbox Live, which will hopefully allow me to play Batman: AA. Now reboot…Wait! Logan’s up from his nap. I’m beginning to wonder if Eidos really wants me to play this game or not. It’s no secret that most kids today are scared to death of math and calculus. But they’re actually quite easy…as long as you don’t let modern school teachers “teach” you any of that “new math” nonsense. If you want to kick it old school, there’s no better way than to teach yourself calculus with Thompson’s Calculus for the Practical Man. This book was catapulted to world renown when Nobel laureate, Richard Feynman, recounted using it to teach himself calculus when he was 13. Feynman credited his success in calculus to having taught himself and to some of the unorthodox methods presented in this book. Sometimes, when others couldn’t even approach a problem, a method he had learned here made the problem almost trivial. If you are at all interested in Calculus, don’t let your first experience be in a classroom setting. You owe it to yourself to teach it to yourself. This book was “old” when Feynman read it, so it’s a bona fide classic today. Rest assured, there is no new math here. Not really. I just want to see if this idea works. I saw Avatar yesterday. It is one of the most hyped and promoted movies of the year, yet many of the ads neglect to let you know that the movie is in 3-D. Here are some thoughts and opinions on the movie. 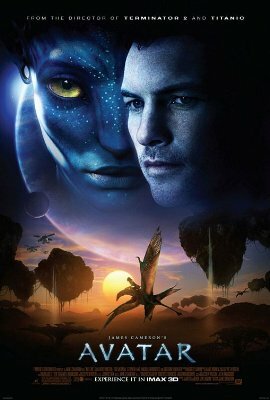 A vatar certainly stands as a breakthrough in 3D technology and movie making, as the movie was shot and designed as a 3D movie from the ground up. The 3D takes a meh movie and turns it into something spectacular. There are moments in the movie where I thought, “If I were seeing this on the regular screen, I would be bored out of my mind, but because it’s 3D, I don’t mind so much.” Think of how the 12 minute podracing scene in the Phantom Menace bogged down the whole middle section of the movie. Well if George Lucas had made it in 3D, it wouldn’t have done so. For the most part, James Cameron doesn’t engage in the cheap trick of having 3D objects being hurled at you in an attempt to get you to duck. Very few of the 3D effects pop out of the screen. Often the most effective use of 3D in the movie is simple ambiance. For example, as the scientists move through the forest the bees buzz around them and out of the screen, making it more immersive. It also highlights one of the current weakness of the 3D technology—fast moving objects lose focus and clarity. Certainly, the coolest 3D visuals are the virtual and holographic displays in the helicopters and in the science labs. The 3D image of the brain scan is simply amazing. It will be interesting to see how the technology and movie making develop. For example, I felt distracted from the movie in several instances because the background of some shots is blurred, while the foreground is in sharp focus. Yes, this is similar to how the eye operates, but in real life, you could choose to focus on the background if you wanted to. In the movie, the choice has been made for you. As many have pointed out, the 3D isn’t perfect, but it is a breakthrough, and in the same way that the first Star Wars trilogy’s effects are painful to watch now, at the time, there was nothing like them. I highly recommend watching it in 3D. Of course then you have the question of which kind of 3D, RealD or Imax 3D? The best description of the different technologies I have been able to find is this article. Basically, the Imax screen is bigger and closer to you, so even without 3D, it seems more like you are in the movie. You have to turn your head to see different parts of the screen, because the screen is too big for your field of vision. Meanwhile, RealD is shown on a traditional (smaller) movie screen, so the 3D effects seem more “in the screen” than popping out at you. We saw it on RealD. I don’t think I’m willing to spend the additional $12 to see it again on Imax 3D to see which one I would prefer. I’ll wait for a better movie to do that. Update: I saw it again on a Liemax screen at Muvico. It was a bit underwhelming. This time, I wasn’t able to sit in the center of the theater, and that definitely made a difference when the effects were “out of the screen”. I really couldn’t tell any difference between the two technologies except that the Imax glasses are much less comfortable to wear for two and a half hours. On the other hand, Jen’s brother saw it on RealD and at a real Imax theater, and he said there was no comparison, the real Imax blew away the RealD version. Is this Dances With Wolves? Avatar’s story is clearly derivative. It’s your basic, person goes to another culture and eventually identifies more with it and turns on his former “friends”. You’ve seen it done as boring as can be in Dances With Wolves. You’ve seen it done with visual flair in The Last Samurai. And now you’ve seen it in 3D in Avatar. As always, the best aspects of these movies are in the joy of discovery and gradual acceptance of the outsider into society. Avatar excels in the discovery department mostly because of the 3D visuals. The story aspect and gradual acceptance takes a back seat. The movie is quite preachy on many levels, and this is its major flaw. No one wants to go to an escape movie to be preached at—especially an escape movie of this scale. The themes of terrorism, U.S. army occupation, ignorant Americans, and environmental destruction are all present even though some of them seem very strained. The cartoonish, over the top, Rambo-style head of security says, “We’ll fight terrorism with terrorism,” even though the guys in blue hadn’t done anything aggressive, let alone terrorism. I also don’t understand why movie makers have to so confuse science and religion, nature and the supernatural. George Lucas completely ruined the force by making it the result of midachlorians. We were fine accepting that in the Star Wars world, the Force existed as a supernatural phenomenon, but once it is revealed that the Force is nothing more than the action of mitochodria midachlorians, the whole thing just becomes hokey. In Avatar, the aliens and animals have some kind of exposed neural interface that they can use to communicate. Some of the plants also have it, and when one of the aliens dies, they bury the body with a seed, and the consciousness of the person is preserved in the resulting tree, making the forest a giant planetary neural network of ancestors—a very cool idea. Then James Cameron has to ruin it by making it nothing more than tribal animism. For me, this is the weakest aspect of the movie. 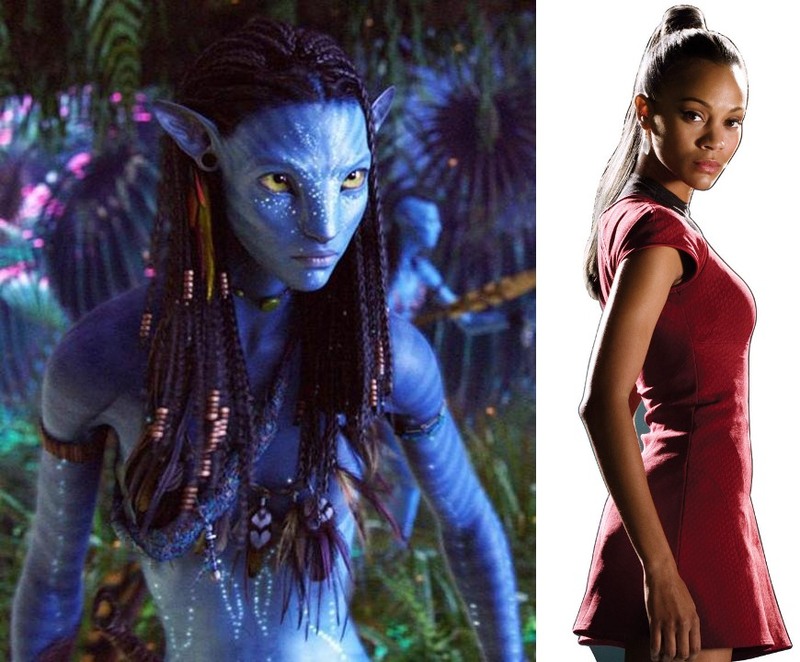 Who would have thought that Zoe Saldana would be sexier as an eight foot, blue, tiger striped alien than as a Federation officer? 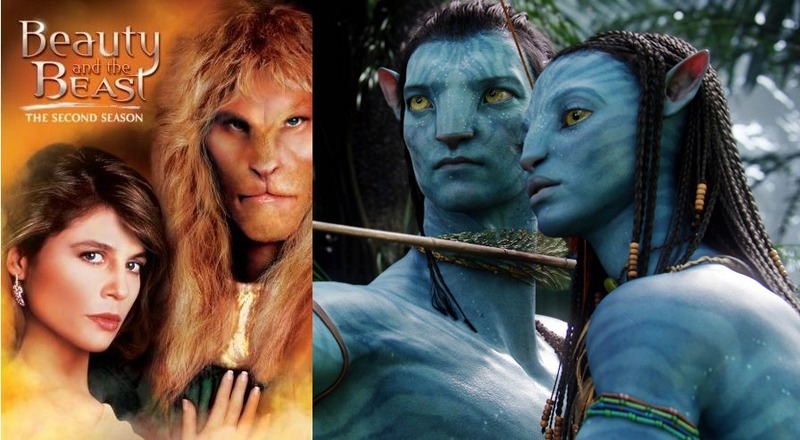 Is it just me or do the Na’vi look remarkably like Vincent (played by the ineffable Ron Perlman) from Beauty and the Beast which happened to also star Linda Hamilton who starred in both Terminator movies and married James Cameron?